Almond Beach Hideaway is on a beautiful white sandy beach. We are located on the northeast, quiet side of the island. The white sandy beach is private and for use by our guests only. The beach includes a gazebo w/hammocks, beach chairs and coconut palms. There is a caretaker nearby that can answer any questions or take care of any concerns that you may have at any time. Almond Beach has easy access to the sea where you can enjoy swimming, snorkeling or diving. Just steps from your door is one of the island's finest snorkeling reefs and dive sites. There are no dangerous tides for you to worry about. You can enjoy sport fishing in the vicinity of the hideaways. At night, you can explore the abundant marine life at the water's edge. Although we currently live in Oregon, my husband was born and raised on Cayman Brac. 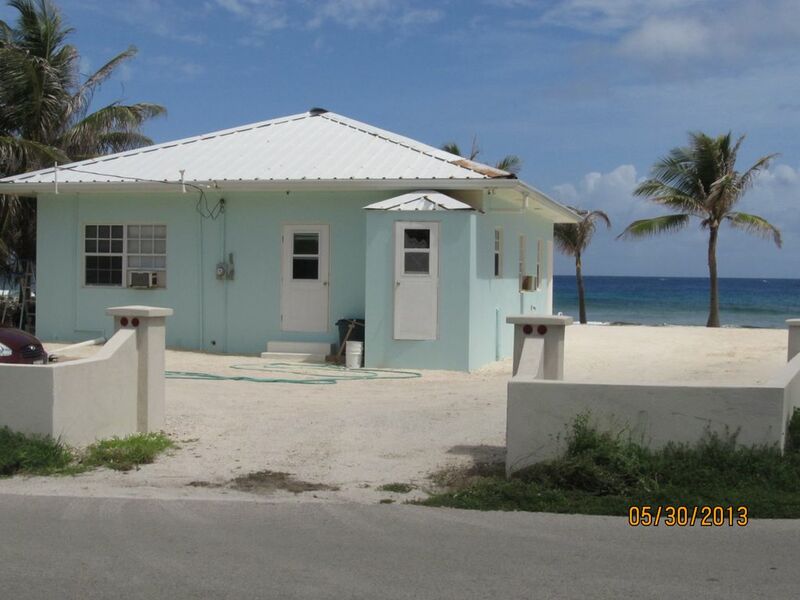 His dream was to have a vacation rental, so tourists could enjoy the friendliness, peace and security of Cayman Brac. Our little piece of paradise is the perfect spot to enjoy the island. Almond Beach has a beautiful white sandy beach. Fishing, snorkeling, sunbathing, shelling, and relaxing on your own private beach. Enjoying the sunrise and the sunsets from your private Gazebo with hammocks. In 2017 we installed central air conditioning for comfort throughout the hideaway! We were the first to stay for 4 months straight. The owners are wonderful to work with. If you don't want to stay on the tourist side of the island this place is for you. We enjoyed staying in the area of the locals. Yes there are sea urchins and when there is bad weather the beach is messy. That is just the way it is. It is not the owners fault. The place was very clean, but the furniture is showing it's age. They had all the necessaries such as T.P., soap, laundry soap etc for us. The caretaker is a very nice woman, she had fish soup waiting for us when we arrived. She was incapacitated while we were there but she made sure that we always had someone to call if there where any problems. We would definitely rent here again. We have always felt that Almond Beach was our little piece of paradise and it sounds like you and your husband felt that way as well. We are glad that you enjoyed your long stay and we so appreciate you choosing Almond beach. We have been making improvements at Almond Beach each year and we will continue to update the furnishings. We are blessed to have such a wonderful caretaker. She is very caring and thoughtful and does her absolute best to help our guests with any need that may arise during their stay. Again, thank you for staying at Almond Beach. My sister and I were looking for a truly relaxing experience for a vacation. We found it here at Almond Beach Hideaway. The owner is absolutely delightful to deal with and worked with us for our getaway. She gave us great tips about the island, and was very pleasant to speak with. Once we got to the island we rented a car, which she told us would be most helpful, and waiting for us was a cooked meal from the groundskeeper, what a magnificent start to our vacation! The groundskeeper, called that evening to make sure we made it in safely and was there for any questions we had, she made our stay even better, she also surprised us with a homemade coconut creme pie!! She offered many tips about the island including where to eat and shop for food. You dont need anything else at the house, kitchen is in full working condition, washer and dryer are great, and air conditioners are wonderful if you use them. House was extremely clean as was the yard. A storm had just passed through and the groundskeeper was concerned we would be upset that the beach wasnt perfect, and it was! The ONLY thing that would have made this vacation that much more perfect was if you could swim right in front of the house, unfortunately there are way too many sea urchins, but diving and snorkeling are a short drive away. This was a magnificent house and vacation!! Looking forward to visiting again in the future! My husband, my 8 yr old daughter spent a wonderful week at Almond Beach. The house was well equipped and in a very quiet location. Starrie and her husband (the caretaker) were wonderful and very helpful. I spent most of the week on the beach chair catching the rays. We couldn't swim right in front of the home due to the sea urchins and the rough water but that was ok, there is a public beach just a short drive away. Both bedrooms were very roomy with plenty of storage. Cayman Brac is a very quiet island and there is very little "tourism" so if you want peace and quiet that is the place to go. Would definitely recommend this place. Thank you Shauna for your positive comments about Almond Beach. We are glad that you ahd a great week. We're sorry the sea was rough because when it is calm, we have a cut in the coral that facilitates entry into the sea for swimming or snorkeling. Cayman Brac is a perfect destination for a peaceful vacation! Perfect getaway from 'life'. Owner very nice and answers all questions and the house manager, Starrie is a beautiful person, as well as her family. Kitchen basically stocked with appliances. Washer and dryer work well. No problem with water pressure in showers. A/C's work great. Very neat and clean. We spend most of our time outside in the hammocks taking in the breathtaking view. The only reason I didn't give it 5 stars was because we had to buy our own toilet paper, paper towels, and dish soap. I feel that should have been included. Other than that I highly recommend Almond Beach Hideaway. We cooked most our meals. The MarketPlace grocery store has the best stock of food and even has frozen meat that was very good. Our 'hangout' was The Captains Table Bar and Restuarant. Cesar and his staff are wonderful. I will for sure be back-to-the-brac! Almond Beach is the perfect "getaway from life"!! Supplies such as toilet paper, paper towels & dish soap are included, but our caretaker had experienced a fall and so she was not on top of things the way she normally would be due to health concerns. Yes, our guests experience a "breathtaking view" every day during their stay! There are locally owned restaurants within walking distance of the hideaway. We are sure you would enjoy the local Caribbean cuisine prepared by these places. There are several hiking destinations within walking distance of the hideaways. The hikes will help you to take in the beauty of the island's scenery. Almond Beach is truly a private area for you to relax, read your favorite book, or take a nap without any safety concerns. You can enjoy the sunset from your front porch or relax in a hammock while the sun sets.